The Indian government spent seven years compiling a national database that includes citizens’ iris scans, fingerprints, addresses, and phone numbers—and now Airbnb, Uber, and India ride-hailing service Ola are all interested in incorporating the system into their services, according to a report from BuzzFeed News. 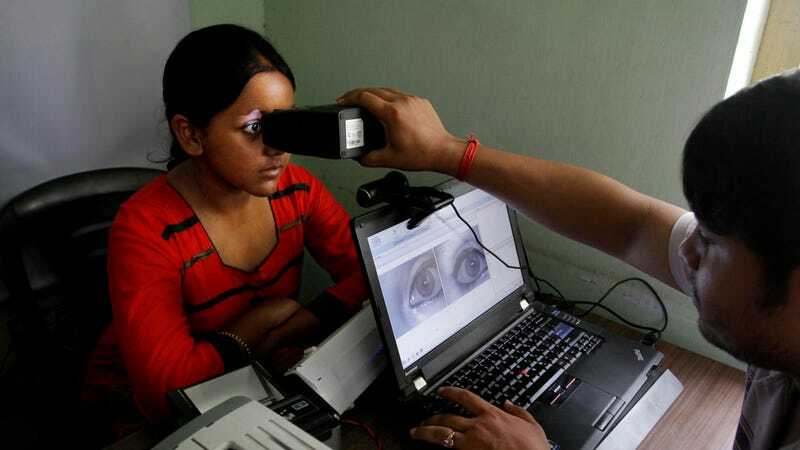 The national ID database, Aadhar, contains information on about 90 percent of India’s population of 1.3 billion people, as well as people working and living in the country. Aadhar was launched in 2009 as a way to inhibit fraud and improve access to welfare and healthcare. But the biometric-based system has been criticized as Orwellian and dangerous because it can be used to monitor residents and because the nation has no privacy regulations. According to a report from India’s Centre for Internet and Society, about 130 million citizens were put at risk of fraud after Aadhar data was recently leaked online. Earlier this month, Microsoft also integrated Aadhar into Skype Lite, but the company said it will keep user information encrypted. As more companies use Aadhar data, the risk of personal data being leaked will likely increase. Anonymous sources at Airbnb, Uber, and Ola told BuzzFeed News how the companies planned to use the controversial system. Airbnb is interested in using the database to authenticate India-based hosts and is already testing it with a sample of users, according to an Airbnb spokesperson. Hosts selected for the test are given the option to use Aadhar to verify their identity. While it seems Airbnb only plans to use the database to ensure users are who they claim to be, Uber and Ola are interested in using Aadhar to verify identities and collect user demographic information. In May, BuzzFeed News learned from an Uber executive that Uber is seriously considering vetting drivers using Aadhar. But the source said that at that time the company was not planning on making the process mandatory for drivers. Ola, however, is obligating new drivers to use Aadhar authentication, starting today. The company decided to enforce the new process after a driver, who reportedly signed up using a fake ID, abducted a rider on July 7. In 2014, Both Uber and Ola updated their verification process after an Uber driver raped a passenger in New Dheli. Here in the US, many cities and advocacy groups have pushed Uber and Lyft to perform fingerprint background checks on drivers as a part of an effort to improve safety standards, but both companies have fought back. Of course, different countries have different perspectives on privacy, so it’s not necessarily fair to judge the Indian government’s approach to data collection based on an American perspective of privacy. Indian lawmakers are still trying to determine if privacy is a fundamental right. But it’s telling that some US-based companies are willing to embrace the lax privacy ethos of other countries whenever it is advantageous to them.